The Arctic National Wildlife Refuge (ANWR or Arctic Refuge) is a national wildlife refuge in northeastern Alaska, United States. It consists of 19,286,722 acres (78,050.59 km2) in the Alaska North Slope region. It is the largest national wildlife refuge in the country, slightly larger than the Yukon Delta National Wildlife Refuge. The refuge is administered from offices in Fairbanks. The Arctic National Wildlife Refuge is the biggest and the wildest land publicly owned by the United States. ANWR includes a large variety of species of plants and animals, such as polar bears, caribou, wolves, eagles, and migratory birds, that rely on the refuge. Just across the border in Yukon, Canada, are two Canadian National Parks, Ivvavik and Vuntut. The National Wildlife Refuge System was founded by President Theodore Roosevelt in 1903, to protect boundless areas of wildlife and wetlands in the United States. This refuge system created the Migratory Bird Treaty Act of 1918 which conserves the wildlife of Alaska. In 1929, a 28-year-old forester named Bob Marshall visited the upper Koyukuk River and the central Brooks Range on his summer vacation "in what seemed on the map to be the most unknown section of Alaska." In February 1930, Marshall published an essay, "The Problem of the Wilderness,", a spirited defense of wilderness preservation in The Scientific Monthly, arguing that wilderness was worth saving not only because of its unique aesthetic qualities, but because it could provide visitors with a chance for adventure. Marshall stated: "There is just one hope of repulsing the tyrannical ambition of civilization to conquer every niche on the whole earth. That hope is the organization of spirited people who will fight for the freedom of the wilderness." The article became a much-quoted call to action and by the late 20th century was considered seminal by wilderness historians. According to environmental journalist Brooke Jarvis, "Marshall saw the enormous, largely unsettled Arctic lands he had explored as a possible antidote to this—not another chance to keep chasing America's so-called Manifest Destiny but a chance to finally stop chasing it." Even for Americans who would never travel there, "he thought they would benefit knowing that it still existed in the condition it always had." "In Alaska alone," Marshall wrote, "can the emotional values of the frontier be preserved." In 1953, an article was published in the journal of the Sierra Club by then National Park Service planner George Collins and biologist Lowell Sumner titled "Northeast Alaska: The Last Great Wilderness". Collins and Sumner then recruited Wilderness Society President Olaus Murie and his wife Margaret Murie with an effort to permanently protect the area. In 1954, the National Park Service recommended that the untouched areas in the Northeastern region of Alaska be preserved for research and protection of nature. The controversy over whether to drill for oil in the National Wildlife Arctic Refuge has been a political controversy since 1977. The debate mainly concerns the "Section of 1002" in ANWR. The section of 1002 is located on the coastal plain where many of the Arctic's diverse wildlife species preside. The usage of section 1002 in ANWR depends on the amount of oil worldwide. There are two sides of this debate: support for drilling and the opposition of drilling. Most of the supporters for drilling are big oil companies and political campaigners who sought to go after the resources that could be found in the refuge. The oppositions of drilling include people who currently reside in Alaska and people who want to preserve the wildlife and land for future considerations. The region first became a federal protected area in 1960 by order of Fred Andrew Seaton, Secretary of the Interior under U.S. President Dwight D. Eisenhower. In 1980, Congress passed the Alaska National Interest Lands Conservation Act. The bill was signed into law by President Jimmy Carter on December 2, 1980. Eight million acres (32,000 km2) of the refuge, the Mollie Beattie Wilderness, are designated as wilderness area. The expansion of the refuge in 1980 designated 1.5 million acres (6,100 km2) of the coastal plain as the 1002 area and mandated studies of the natural resources of this area, especially petroleum. Congressional authorization is required before oil drilling may proceed in this area. The remaining 10.1 million acres (40,900 km2) of the refuge are designated as "minimal management," a category intended to maintain existing natural conditions and resource values. These areas are suitable for wilderness designation, although there are presently no proposals to designate them as wilderness. Currently, there are no roads within or leading into the refuge, but there are a few Native settlements scattered within. On the northern edge of the refuge is the Inupiat village of Kaktovik (population 258) and on the southern boundary the Gwich'in settlement of Arctic Village (population 152). A popular wilderness route and historic passage exists between the two villages, traversing the refuge and all its ecosystems from boreal, interior forest to Arctic Ocean coast. Generally, visitors gain access to the land by aircraft, but it is also possible to reach the refuge by boat or by walking (the Dalton Highway passes near the western edge of the refuge). In the United States, the geographic location most remote from human trails, roads, or settlements is found here, at the headwaters of the Sheenjek River. Natural-color satellite image of the refuge. Thick white lines delineate refuge boundaries, and thin white lines separate areas within the park. Arctic National Wildlife Refuge Map. The Arctic is mostly an ocean surrounded by land. The Arctic is relatively covered by water, much of it is frozen. The glaciers and icebergs in the Arctic make up about 10% of Earth's land area. Most of the Arctic's liquid saltwater is from the Arctic Ocean's basin. Some parts of the ocean's surface are frozen all or most of the year. The Arctic area is mainly known for sea ice surrounding the region. The Arctic experiences extreme solar radiation. During the Northern Hemisphere’s winter months, the Arctic experiences cold and darkness which makes it one of the unique places on Earth. North America's two largest alpine lakes (Peters and Schrader) are located inside the refuge. ANWR is nearly the size of South Carolina. 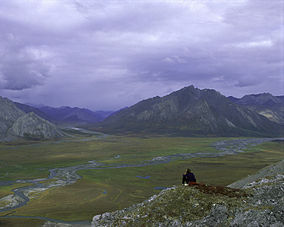 Area 1002 of the Arctic National Wildlife Refuge coastal plain, looking south toward the Brooks Range mountains. The refuge supports a greater variety of plant and animal life than any other protected area in the Arctic Circle. A continuum of six different ecozones spans about 200 miles (300 km) north to south. Along the northern coast of the refuge, the barrier islands, coastal lagoons, salt marshes, and river deltas of the Arctic coastal tundra provide habitat for migratory waterbirds including sea ducks, geese, swans, and shorebirds. Fish such as dolly varden and Arctic cisco are found in nearshore waters. Coastal lands and sea ice are used by caribou seeking relief from biting insects during summer, and by polar bears hunting seals and giving birth in snow dens during winter. The Arctic coastal plain stretches southward from the coast to the foothills of the Brooks Range. This area of rolling hills, small lakes, and north-flowing, braided rivers is dominated by tundra vegetation consisting of low shrubs, sedges, and mosses. Caribou travel to the coastal plain during June and July to give birth and raise their young. Migratory birds and insects flourish here during the brief Arctic summer. Tens of thousands of snow geese stop here during September to feed before migrating south, and muskoxen live here year-round. South of the coastal plain, the mountains of the eastern Brooks Range rise to over 9000 feet (3,000 m). This northernmost extension of the Rocky Mountains marks the continental divide, with north-flowing rivers emptying into the Arctic Ocean and south-flowing rivers joining the great Yukon River. The rugged mountains of the Brooks Range are incised by deep river valleys creating a range of elevations and aspects that support a variety of low tundra vegetation, dense shrubs, rare groves of poplar trees on the north side and spruce on the south. During summer, peregrine falcons, gyrfalcons, and golden eagles build nests on cliffs. Harlequin ducks and red-breasted mergansers are seen on swift-flowing rivers. Dall sheep, muskoxen, and wolf packs are active all year, while grizzly bears and Arctic ground squirrels are frequently seen during summer but hibernate in winter. 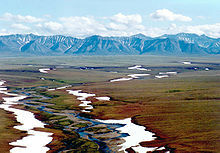 The southern portion of the Arctic Refuge is within the Interior Alaska-Yukon lowland taiga (boreal forest) ecoregion. Beginning as predominantly treeless tundra with scattered islands of black and white spruce trees, the forest becomes progressively denser as the foothills yield to the expansive flats north of the Yukon River. Frequent forest fires ignited by lightning result in a complex mosaic of birch, aspen, and spruce forests of various ages. Wetlands and south-flowing rivers create openings in the forest canopy. Neotropical migratory birds breed here in spring and summer, attracted by plentiful food and the variety of habitats. Caribou travel here from farther north to spend the winter. Other year-round residents of the boreal forest include moose, polar foxes, beavers, Canadian lynxes, martens, red foxes, river otters, porcupines, muskrats, black bears, wolverines, and minks. Each year, thousands of waterfowl and other birds nest and reproduce in areas surrounding Prudhoe Bay and Kuparuk fields and a healthy and increasing caribou herd migrates through these areas to calve and seek respite from annoying pests. The question of whether to drill for oil in the ANWR has been an ongoing political controversy in the United States since 1977. The controversy surrounds drilling for oil in a subsection of the coastal plain, known as the "1002 area". ANWR is 19,286,722 acres (78,050.59 km2). The coastal plain is 1,500,000 acres (6,100 km2). The current proposal would limit development to 2,000 acres (8.1 km2) of that plain. Much of the debate over whether to drill in the 1002 area of ANWR rests on the amount of economically recoverable oil, as it relates to world oil markets, weighed against the potential harm oil exploration might have upon the natural wildlife, in particular the calving ground of the Porcupine caribou. The Arctic is found to have an immense amount of oil and natural gas deposits. Specifically, ANWR inhabits the land which sits on 7.7 to 11.8 billion barrels of oil. In Alaska, it is known for major oil companies to work with the indigenous groups, "native corporations" to drill and export millions of oil barrels every year. It is estimated 5 billion and 16 billion barrels of oil and natural gas within the coastal plain of the refuge. This has contributed to the huge political controversy of whether or not to drill in this area. Most of the debate over whether to drill in the “1002 area” of ANWR relies on the approximate economically recoverable oil around the world. The opposed side of the controversy stresses the potential harm that oil exploration and drilling might have on the natural wildlife. Nearly all countries in the Arctic are rushing to claim the refuge to have the resources and minerals found in the Arctic. This rivalry including these countries is known as the "New Cold War" or "Race for the Arctic." Republicans argued for years that drilling should be allowed since there would be over $30 million of revenue and create as many as 130,000 jobs. Furthermore, Republicans claim that drilling will make the United States more independent from other countries because the practice of drilling will increase the oil reserves of the country. For Republicans to grant this theory, they would need 51 votes to pass the House bill that cannot include the ANWR drilling language. People who oppose the drilling in the Arctic National Wildlife Refuge believe that it would be a threat to the lives of indigenous tribes. Those tribes rely on the ANWR's wildlife, its animals, and plants that reside in the refuge. Moreover, the practice of drilling could present a potential threat to the region as a whole. When companies are exploring to drill they are extracting the vegetation and destroying permafrost which causes harm to the land. Scientists are noticing that sea levels are rising at increasing rates. Sea levels are rising because polar ice caps are melting at a rapid pace. This process starts in the Arctic region, specifically in Alaska. Researchers at Oxford University explained that increasing temperatures, melting glaciers, thawing permafrost, and rising sea levels are all indications of warming throughout the Arctic. Sea Ice has thinned and decreased. Thinning has occurred due to the sun melting the ice at a higher pace. This backs up the concept of how the Arctic region is the first to be affected by climate change. Shorefast ice tends to form later in fall. In September 2007, the concentration of sea ice in the [Arctic Ocean] was significantly less than ever previously recorded. Although the total area of ice built up in recent years, the amount of ice continued to decline because of this thinning. Climate change is happening faster and more severe in the Arctic compared to the rest of the world. According to NASA, the Arctic is the first place that will be affected by global climate change. This is because shiny ice and snow reflect a high proportion of the sun's energy into space. The Arctic gradually loses snow and ice, bare rock and water absorb more and more of the sun's energy, making the Arctic even warmer. This phenomenon is called the albedo effect. This area for possible future oil drilling on the coastal plains of the Arctic National Wildlife Refuge, encompasses much of the Porcupine caribou calving grounds. Migratory caribou herds are named after their birthing grounds, in this case the Porcupine River, which runs through a large part of the range of the Porcupine herd. In 2001, some biologists feared development in the Refuge would "push caribou into the foothills, where calves would be more prone to predation." Though numbers fluctuate, there were approximately 169,000 animals in the herd in 2010. Their 1,500 miles (2,400 km)-a-year land migration between their winter range in the boreal forests of Alaska and northwest Canada over the mountains to the coastal plain and their calving grounds on the Beaufort Sea coastal plain, is the longest of any land mammal on earth. In 2001, proponents of the development of the oil fields at Prudhoe Bay and Kuparuk, which would be approximately 60 miles (97 km) west of the Refuge, argued that Central Arctic caribou herd, had increased its numbers "in spite of several hundred miles of gravel roads and more than a thousand miles of elevated pipe." However, the Central Arctic herd is much smaller than the Porcupine herd, and has an area that is much larger. By 2008 the Central Arctic caribou herd had approximately 67,000 animals. The Arctic National Wildlife Refuge is directly connected to Polar Bears. These bears are known for traveling in the region to den and give birth. Nearly 50 of these species migrate along the coast to the refuge in September. These bears extend more than 800 miles along the coast of Northern Alaska and Canada. Due to changes in climate, Polar bears are recorded to now spend more time on land waiting on new sea ice to form, as they depend on sea ice for much of their hunting. This limits their ability to hunt seals to build up fat for hibernation. Much controversial, the polar bears are widely affected by the climate change happening in this region. Pregnant females are forced to move onshore at unusual times to dig their dens. Usually, the bears are known to dig their dens in November, then give birth to one to two tiny cubs in December or January. The mothers then nurse and care for the young until March or early April, when they loom from the dens. After several days adapting to the outside environment, the families leave the dens. They move back to the sea ice to hunt ringed seals and other prey. The cubs always stay with their mothers for about the next two and a half years. Polar Bears follow the trace of current carrying sea ice which leads them to travel south. This often leads them to relying on trash abundances for nutrition. This food source impacts the health of polar bears negatively. They also begin targeting unusual animals as prey. The Arctic National Wildlife Refuge is the only refuge that regularly dens polar bears in that local region, and contains the most consistent amount polar bears in the area. The Arctic basin is the shallowest ocean basin on Earth. It is the least salty, because of low evaporation and large current of freshwater from rivers and glaciers. River mouths and calving glaciers, are continually moving ocean currents contribute to a unique marine ecosystem in the Arctic. The cold, circulating water is rich in minerals, as well as the microscopic organisms (such as phytoplankton and algae) that need them to grow. Marine animals thrive in the Arctic. There are 12 species of marine mammals of the Arctic found in the refuge. They consist of four species of whales, polar bears, the walrus and six species of ice-associated seals, sperm whales, blue whales, fin whales, humpback whales, killer whales, Harbor Porpoise. In this Arctic marine food web consists of Primary consumers, Secondary consumers, Tertiary consumers, and scavengers. Marine mammals in the Arctic are having severe impacts from human-life that are disturbing. Such as noises from industrial activity, offshore seismic oil exploration, and well drilling have affected the migration of marine mammals. The people who live in this Refuge have accustomed over thousands of years to both survive and prosper in these harsh conditions. Different cultures may be found in the various regions of the Arctic, from Lapps in Finland and Norway to the Chuckchi and Koyaki in Siberia. There are two villages whose history are tied to the Arctic Refuge and have been for thousands of years which are the Kaktovik and the Arctic Village. Kaktovik is an Inupiaq village of about 250 current residents located within the Arctic National Wildlife Refuge along the Beaufort Sea. The Inupiaq Village is used as a traditional summer fishing and hunting location. Furthermore, this location also became a usual place for commercial whalers in the late 1800s, which then led them into a permanent residents in the Refuge. ^ Burke, Leann. "Diversity of species calls wildlife refuge home". U.S Fish & Wildlife Service. Retrieved 12 April 2018. ^ a b "The Last Stand of the Last Great Wilderness". Sierra Club. 29 October 2018. Retrieved 30 November 2018. ^ Shabecoff, P. (2012). A Fierce Green Fire: The American Environmental Movement. Island Press. ISBN 978-1-59726-759-5. Retrieved 30 November 2018. ^ Nash, R.F. ; Miller, C. (2014). Wilderness and the American Mind: Fifth Edition. Yale University Press. p. 200. ISBN 978-0-300-15350-7. Retrieved 30 November 2018. ^ Kaye, Roger. "The Arctic National Wildlife Refuge: An Exploration of the Meanings Embodied in America's Last Great Wilderness" (PDF). Volume 2 (15). USDA Forest Service Proceedings. Retrieved 16 July 2014. ^ "Time Line: Establishment and management of Arctic Refuge - Arctic". U.S. Fish and Wildlife Service. Retrieved 30 November 2018. ^ "Regional Studies - Alaska Petroleum Studies, Arctic National Wildlife Refuge (ANWR-1002 area)". energy.usgs.gov. Retrieved 25 April 2018. ^ Krear, PhD, Robert (July 2000). "The Muries Made the Difference". The Muries Voices for Wilderness & Wildlife: 19–20. ^ Murie, Olaus. "Look Ye Also While Life Lasts". The Muries: Voices for Wilderness and Wildlife. ^ King, Seth S. (December 3, 1980). "Carter Signs a Bill to Protect 104 Million Acres in Alaska". New York Times. nytimes.com. Retrieved 14 December 2017. ^ Wilderness Institute, University of Montana (2011). "Mollie Beattie Wilderness". Wilderness.net. Retrieved 29 November 2011. ^ "President Obama Calls on Congress to Protect Arctic Refuge as Wilderness". The White House. 25 January 2015. Retrieved 26 January 2015. ^ Shogren, Elizabeth. "For 30 Years, a Political Battle Over Oil and ANWR." All Things Considered. NPR. 10 November 2005. ^ "Potential Oil Production from the Coastal Plain of the Arctic National Wildlife Refuge: Updated Assessment". US DOE. Archived from the original on 3 April 2009. Retrieved 14 March 2009. "Surface development on the federal land would be limited to 2,000 acres." ^ a b c Mitchell, John. "Oil Field or Sanctuary?" National Geographic 1 August 2001. ^ "Climate Change in the Arctic | National Snow and Ice Data Center". nsidc.org. Retrieved 25 April 2018. ^ "Quick Facts on Arctic Sea Ice | National Snow and Ice Data Center". nsidc.org. Retrieved 25 April 2018. ^ Jackson, Randal. "Global Climate Change: Effects". Climate Change: Vital Signs of the Planet. Retrieved 25 April 2018. ^ "Albedo effect". Norwegian Polar Institute. Retrieved 25 April 2018. ^ Service, U.S. Fish and Wildlife. "U.S. Fish and Wildlife Service". www.fws.gov. Retrieved 25 April 2018. ^ "Arctic Refuge Has Lots of Wildlife—Oil, Maybe Not So Much". 19 December 2017. Retrieved 25 April 2018. ^ "Threats to Polar Bears". Retrieved 25 April 2018. ^ "Arctic National Wildlife Refuge". arcticcircle.uconn.edu. Retrieved 25 April 2018. Wikimedia Commons has media related to Arctic National Wildlife Refuge.